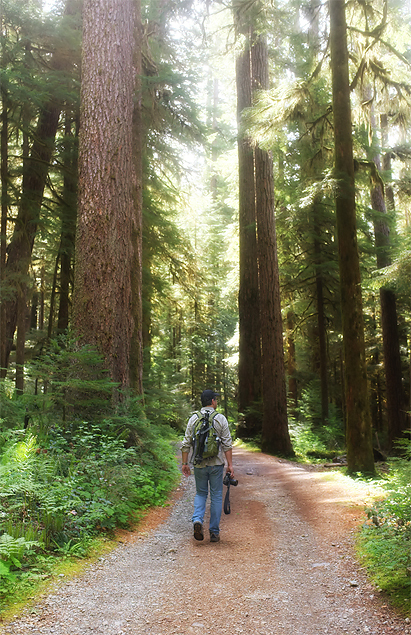 Day two of our Memorial Day weekend found us exploring Opal Creek Ancient Forest Wilderness Area. 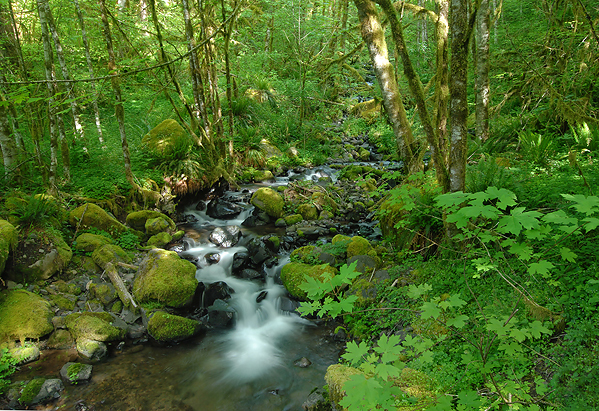 Just 2 hours out of Portland, this scenic area is a hidden gem! We’d visited once before and spent an afternoon hiking along the old mining roads to the small town (population 10) of Jawbone Flats. 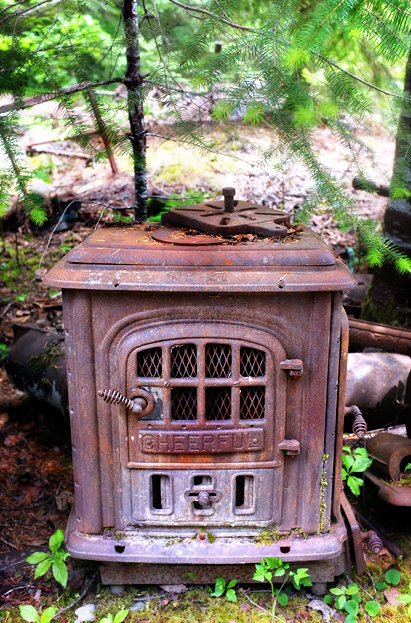 This weekend we hoped to spend more time exploring the surrounding areas of Santiam River….beautiful country – all of it! We began our hike early Saturday morning and we were disappointed to see that the road to Jawbone Flats was closed due to construction. Apparently, winter rains and snow washed away some of the roads along the old tresses and had become unsafe. This was unfortunate because part of the appeal of the hike, in my opinion, was walking through the historic area of Jawbone Flats proper. 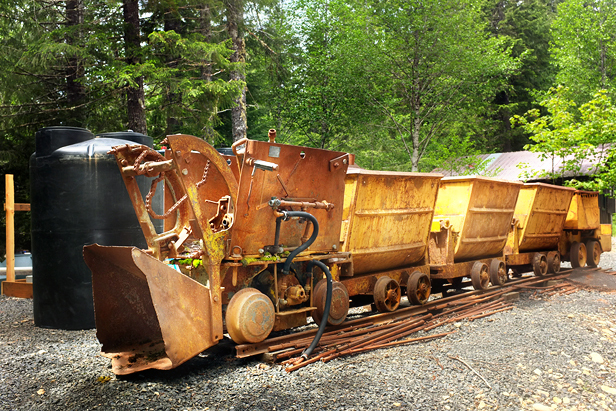 Regardless, we made our way up the mountain side of the hike and found ourselves in the back area of the little town where all the old mining equipment is on display. Really, the only part of the town that was inaccessible was the area around the small cabins and information booth. Beginning the hike along the old mining road through the ancient forest. 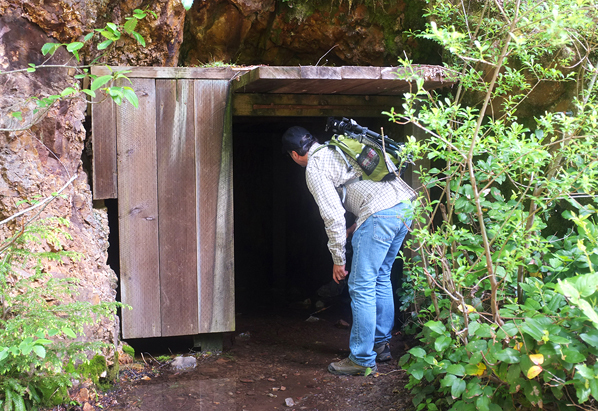 Old mine shaft near the beginning of the hike. 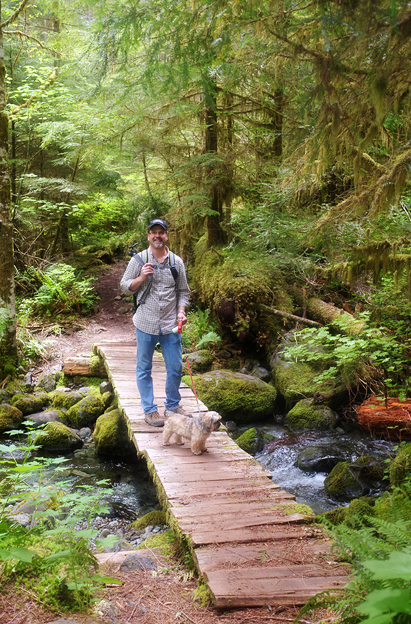 Walking along Opal Creek. Spectacular color even on a cloudy day! 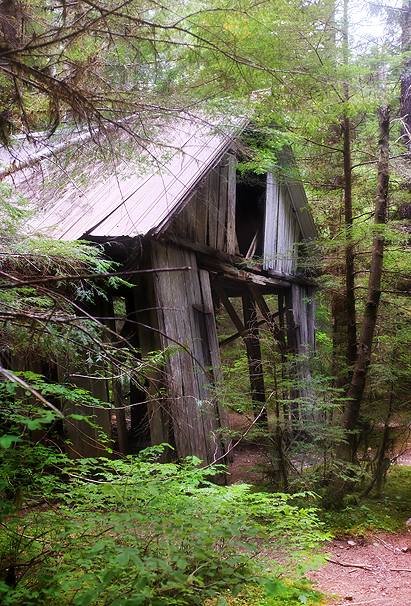 If you do this hike, be sure to look for the old sawmill on the right hand side of the road – a delapidated old building barely standing. If you veer right at this point, you’ll come to a spectacular waterfall. We almost missed this during our first trip, and had we not know it was there we would have missed one of the most scenic areas of the hike. 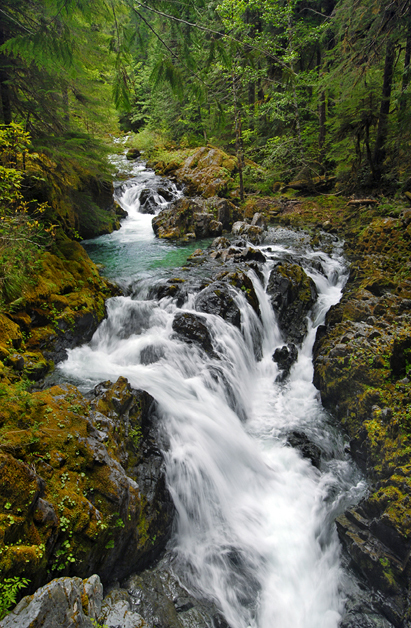 The waterfall, known as Sawmill Falls is not signed and is easy to miss. If you come to the bridge where you turn to walk up the hillside, you’ve gone too far! 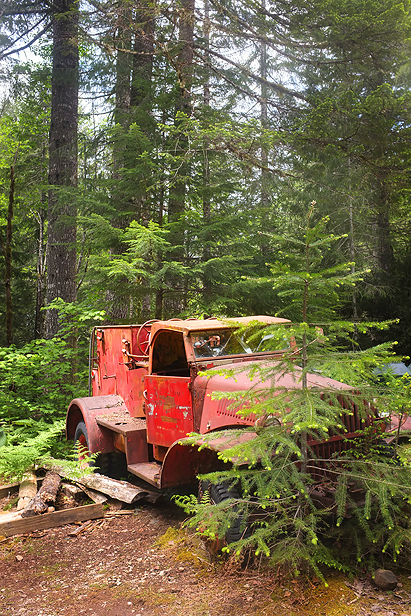 The old Sawmill…probably won’t be there too much longer! 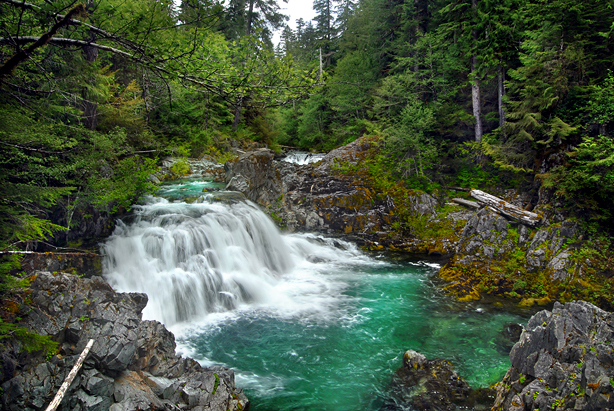 View of Sawmill Falls..not to be missed! 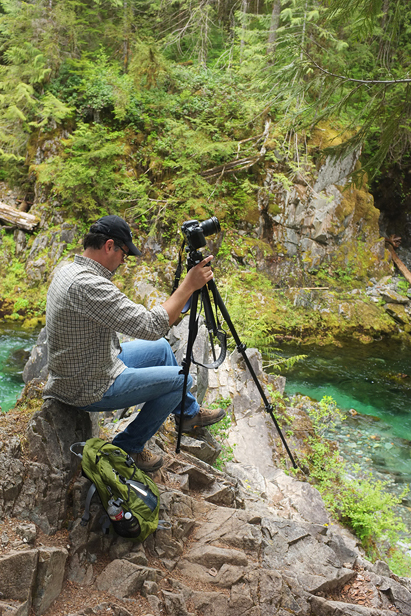 Todd setting up my tripod for me…I’m not a fan of small spaces with steep drops! 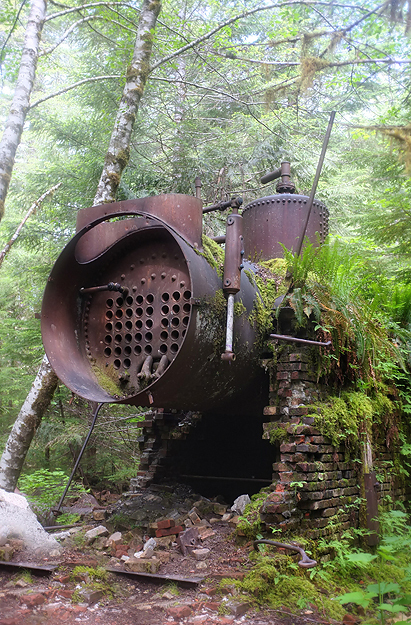 Old Boiler near the Sawmill. Kind of fun to walk around and explore. 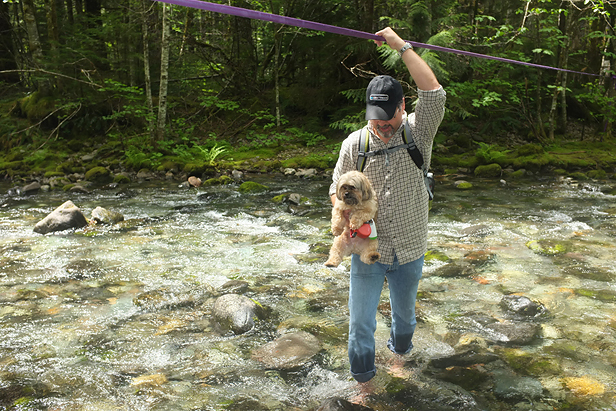 Crossing a creek bed and helping our furry hiking friend along. After you leave Sawmill Falls, you’ll make your way along the hillside, through the forest with views of the creek in the valley below. 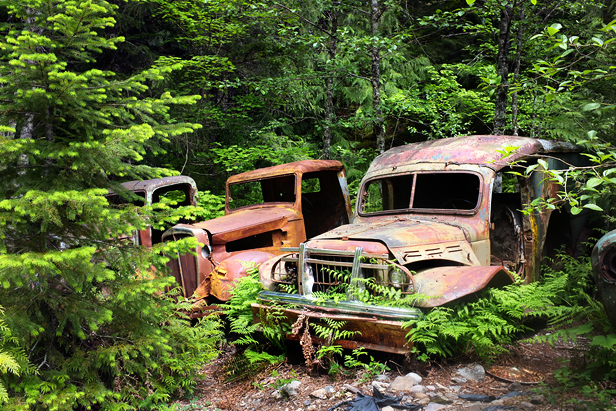 Just outside of Jawbone Flats…fun history to walk around and explore. Once you’ve made your way through the Jawbone Flats area it’s just a short hike to Opal Pools. 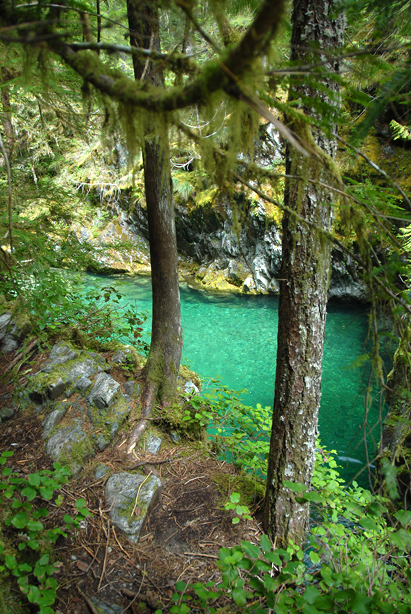 I assumed the pools were given the name because of the spectacular color, but apparently Opal was a named after the wife of a ranger in the area. Before that the area was known as Boulder Creek. 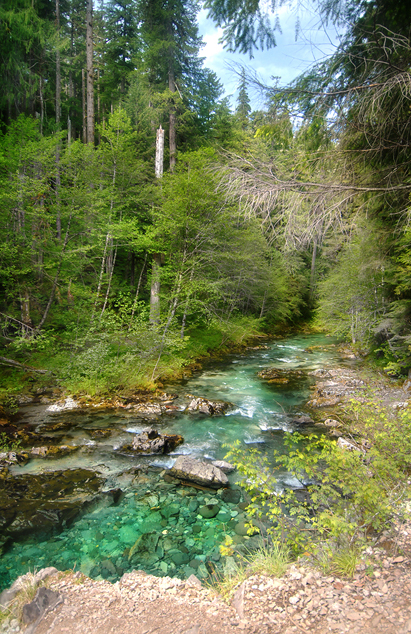 Opal Creek is much more fitting though – don’t you think! Opal Pool…the water really is this color…no Photoshop here! Apparently it remains about 42 degrees year round. A view of some of the many falls that feed the pool. Another beautiful falls along the walk. Pretty little area we discovered on our way out. 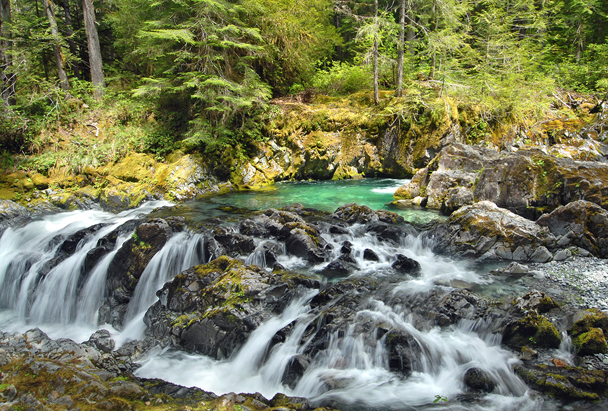 If you’re in the area, want an easy hike that the entire family can do – Opal Creek to Jaw Bone Flats will NOT disappoint! Just added this to the list. We were planning an Oregon trip this summer, but had to have a lot of skin cancer removed from my nose. I wanted to be healed up before I go back 2 my 4th graders. School starts 4 us the 7th. Hope u r enjoying ur summer. Love ur photos and adventures.